Ultimate design software for the Treatment, Optimization and Design for Activated Sludge Waste Water Treatment Plants. SassproV2: Design software for wastewater treatment plant design. It takes minutes not hours or days to evaluate process design of a new WWTP. Optimize your existing plant for present flow conditions. Adjustments can also be made via a smart phone with our optional add-on SCADA CLOUD BASE W/ALARMING feature. SassproV2: *Plant View & Control *Trending & History Access *SCADA Alarming Pkg Over the Cloud * Alarm History and Report Screens * Access Data in CSV or Excel Format for Creating Reports or Download Custom Reports * One (1) PC or 4 Mobile devices can connect at any one time per single user client license * Full system and data Backups. SassproV2: The most efficient and effective design tool for determining: Appropriate process to meet Effluent Requirements. The program calculates Clarifier size/Tank Size/Pumping Requirements/Effluent parameters/WAS & RAS and many more. • Over 120 activated sludge process outputs. Built-in operational calculations. Standard plant metrics (loadings, efficiencies, removals, PE etc), and automatic unit conversions. SASSProV2 is unmatched as a powerful wastewater process calculator. • Live reactor status reports facilitate study of biological processes within individual reactor zones of the activated sludge process. Instant feedback illustrating flows, reactor volumes, and RBCOD, nitrate, phosphorus, oxygen, nitrification and denitrification levels. • Diagnostic Test module provides flexibility for operational, design and regulatory tests on plant processes. 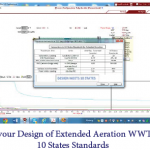 Lets you compare to 10 States Standards or TCEQ 217. SASSPro V2 requires no lengthy user training courses and is a fraction the cost of top-end process simulators. And, if you need help setting up your process simulations – expert assistance is only an email away.